Background: Diabetes mellitus is a chronic metabolic disorder of hyperglycemia. Chronic hyperglycemia produces advanced glycation end products such as the methylglyoxal (MGO) which interferes with cell functions, insulin signaling, and β-cell functions. The present study was conducted to determine the effects of berberine (BBR) therapy on serum MGO and insulin resistance in newly diagnosed type 2 diabetic patients. Materials and Methods: The present case–control study was conducted at the Department of Medicine, Liaquat University of Medical and Health Sciences, Jamshoro/Hyderabad, from March 2016 to January 2017. A sample of 200 newly diagnosed type 2 diabetic patients was divided into two groups. Group 1 received metformin 500 mg (×3 daily) and Group 2 received BBR 500 mg (×3 daily) for 3 months. Blood samples were collected at baseline and after 3 months to analyze biochemical parameters on Roche biochemical analyzer. MGO was assayed by ELISA kit and homeostasis model assessment of insulin resistance (HOMA-IR) model. SPSS version 23.0 (IBM, Incorporation, USA) analyzed the data at 95% confidence interval (P ≤ 0.05). Results: Baseline HOMA-IR (% IR) and MGO were found elevated in metformin and BBR groups. After 3 months of metformin and BBR therapy, the HOMA-IR (% IR) and MGO were decreased to 3.69 ± 1.13 and 2.64 ± 0.76 and 35.84 ± 12.56 and 26.64 ± 10.73 ng/dl, respectively (P = 0.0001). HOMA-IR (% IR) was improved by 40% and 73% (P = 0.0001) and MGO by 43% and 56% in metformin and BBR groups, respectively (P = 0.0001). Conclusion: BBR is more effective in decreasing the serum MGO levels and insulin resistance through improved glycemic control in newly diagnosed type 2 diabetic patients. Diabetes mellitus (DM) is a chronic disorder of glucose metabolism. Chronic rise in blood glucose levels is termed as the hyperglycemia., Chronic hyperglycemia associated with oxidative stress in DM produces a variety of glucose-derived toxic agents called the “α-oxoaldehydes.” The α-oxoaldehydes react with N-terminal amino group of proteins to form the advanced glycation end products (AGEs). Methylglyoxal (MGO) is one of the α-oxoaldehydes which interferes with cell functions, insulin signaling, and β-cell functions., The MGO has been implicated in the pathogenesis of micro- and macrovascular complications of DM. The MGO interferes with vascular endothelial cell functioning and plays a role in the insulin resistance, systemic hypertension, diabetic neuropathy, and nephropathy., Primary pathway of MGO biosynthesis remains elusive, but a variety of sources is implicated. It is not only the glucose and but also the hyperglycemia that causes MGO formation., Raised blood MGO levels are reported in the type 2 DM patients. Plasma MGO-derived hydroimidazolone-free levels are reported elevated in the diabetics compared to nondiabetic participants. High baseline serum levels of MGO-derived hydroimidazolone type of AGE-modified proteins are reported to be associated with more chances of mortality due to the cardiovascular disease. Previous studies , reported that elevated intracellular MGO levels following postprandial hyperglycemia are a risk for the diabetic macroangiopathy. Biguanides are inhibitors of AGE formation lower the serum MGO levels and suppress the microangiopathy independent of its blood glucose-lowering potential., Recent studies , have reported glucose-lowering efficacy of berberine (BBR) which is a natural herbal alkaloid, derived from an ancient Chinese herb Coptis chinensis Franch. BBR is an isoquinoline alkaloid, a separate class of biomolecules, which differs from thiazolidinediones, dipeptidyl peptidase-IV inhibitors, rosiglitazone, sulfonylureas, and biguanides. BBR has been a traditional medicine for DM in China since centuries back., Previous clinical and animal studies , had reported efficacy of BBR for the hyperglycemia of DM. BBR reduces fasting and postprandial blood glucose, total cholesterol, and triglyceride., As the MGO contributes to the diabetic micro- and macroangiopathy independently, there is a need to investigate new agents such as BBR of their possible MGO-lowering potential. In this context, the present study was designed to analyze the MGO and insulin resistance ameliorating activity of BBR in type 2 diabetic patients at our tertiary care hospital. Ethical permission for the present case–control study was taken from the institutional research and ethical committee. The study was conducted at the Department of Medicine, Liaquat University of Medical and Health Sciences, Jamshoro/Hyderabad, Sindh, from March 2016 to January 2017. The research protocol and pro forma were designed for data collection. Newly diagnosed type 2 DM cases of age ≥25 years taking drug metformin were included in the study. Type 2 DM cases taking sulfonylurea, herbal drugs, HMG-CoA reductase inhibitors, and multivitamin pills and insulin; type 2 DM cases with diabetic complications; and type 2 diabetics with concomitant chronic viral hepatic disorders, coronary ischemic heart disease, chronic kidney disease, and pregnancy were excluded from the study. Newly diagnosed type 2 diabetic patients were interviewed and asked for their willingness of study. They were informed of the purpose of study in detail; advantages and disadvantages were negotiated. It was informed that the new drug (BBR) is reported effective, but local study is lacking and the present research has to prove efficacy of drug in our indigenous population. Willing participants were asked to sign the consent pro forma voluntarily. Participants were informed that they have right to withdraw from study protocol at any time because of any personal issue without informing the problem. They were further directed that this will not affect the future diabetic therapy. About 100 newly diagnosed type 2 diabetic patients (Group 1) took metformin, while age- and gender-matched 100 newly diagnosed type 2 diabetic patients (Group 2) were prescribed BBR therapy. Prior ethical approval was taken from the Institutional Ethics Committee. The research details and designed pro forma were provided to the institutional committee. Newly diagnosed type 2 diabetic patients were prescribed metformin – 500 mg × 3 daily (Glucophage, Merck Pharmaceuticals) and BBR – 500 mg × 3 daily. Drug therapy was given for 3-month duration. Diabetic patients were examined by a medical officer; participants who fulfilled the inclusion and exclusion criteria were referred to consultant physician. Demographic characters were entered in the pro forma. Blood samples were collected for biochemical analysis of research variables at the baseline and end of the BBR therapy. Blood samples were taken at baseline and after 3rd month of intervention. Blood sampling area was cleaned with alcohol swab after tourniquet was applied. About 10 ml blood was taken by venesection into disposable syringe (BD, USA). Blood was centrifuged at ×3000 rpm for 10–15 min. Sera were separated and stored at −20°C temperature for biochemical analysis. Biochemical tests – blood glucose, fasting insulin, glycated hemoglobin A1c (HbA1c), blood lipids, and serum creatinine – were measured by standard methods. Laboratory is equipped with Roche biochemical analyzer (Cobas e 411 analyzer, Roche Diagnostics GmbH, Mannheim, Germany). Homeostasis model assessment of insulin resistance (HOMA-IR) was calculated by fasting insulin × fasting glucose/22.5. MGO (ng/dl) was measured by ELISA technique at 450 nm as the primary wavelength of absorbance on a microplate reader. Reference value for magnesium in serum is 0.5–1.5 ng/L. The Statistical Package for the Social Sciences version 23.0 (SPSS - IBM, Incorporation, USA) analyzed the data by applying Student's t-test and Chi-square test for the continuous and categorical variables, respectively, at 95% confidence interval (P ≤ 0.05). Demographic characteristics and baseline biochemical findings of study groups are shown in [Table 1]. Baseline laboratory findings reveal nonsignificant differences between study groups (P > 0.05). 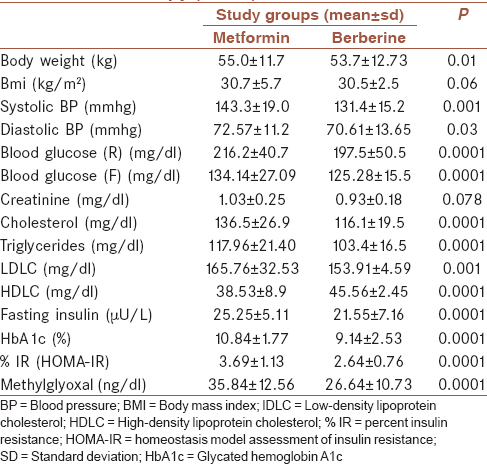 Baseline HOMA-IR (% IR) was noted as 3.73 ± 1.15 and 3.68 ± 1.30 in metformin and BBR groups, respectively (P = 0.85). MGO was found raised in both groups, 63.9 ± 16.37 and 59.92 ± 20.70 ng/dl (P = 0.28) at baseline [Table 1]. Findings after 3 months of BBR therapy show significant decrease in the body weight, systemic blood pressure, body weight, body mass index, blood glucose, cholesterol, triglycerides, low-density lipoprotein cholesterol (LDLC), and fasting insulin, and HbA1c, while high-density lipoprotein cholesterol (HDLC) was raised (P < 0.05) as shown in [Table 2]. HOMA-IR (% IR) and MGO were decreased and noted as 3.69 ± 1.13 and 2.64 ± 0.76 and 35.84 ± 12.56 and 26.64 ± 10.73 ng/dl in metformin and BBR groups, respectively (P = 0.0001). HOMA-IR (% IR) was improved by 40% and 73% in metformin and BBR groups, respectively (P = 0.0001). MGO showed a 43% and 56% decrease in metformin and BBR groups, respectively (P = 0.0001) [Graph 1] and [Graph 2]. This is the first case–control study being reported from a tertiary care hospital of Sindh. Baseline physical and biochemical parameters showed matched study participants. 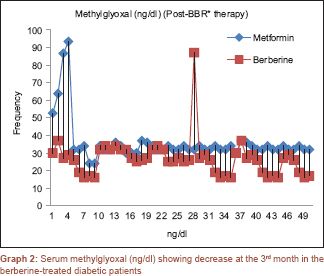 BBR 500 mg three times daily for 3 months was compared with metformin in newly diagnosed type 2 diabetics. Diabetics treated with BBR showed statistically significant decrease in the systemic blood pressure, fasting and random blood glucose, glycated HbA1, serum creatinine, serum cholesterol, serum triglycerides, serum LDLC, serum HDLC, and fasting insulin after 3-month BBR therapy (P < 0.05). These findings are consistent with previous studies , which have reported similar observations. BBR decreases blood glucose level which is in agreement with a previous study  that reported decrease in both fasting and random blood glucose by 21% and 27%, respectively. A decrease in blood lipids is supported by another previous study, which reported the 500 mg BBR three times daily decreased fasting blood glucose by 31%, triglyceride by 40%, and cholesterol by 23%. A previous meta-analysis  based on randomized controlled trial of 1068 patients of type 2 diabetics treated with BBR reported it has antihyperglycemic and antihyperlipidemic potential. Similar findings are being reported by the present study that the BBR ameliorates the blood lipid levels, blood glucose, and insulin resistance. HOMA-IR (% IR) was improved by 40% and 73% in metformin and BBR groups, respectively (P = 0.0001). These findings are supported by previous studies , which reported metformin decreased HOMA-IR by 8.12% and BBR by 29.5%. Our findings show more prominent reduction compared to Almani et al. BBR was more effective than metformin in the present study which is in agreement with Dange et al. This previous study  reported that the BBR was superior to metformin in ameliorating the glycemic control in type 2 diabetic patients. Yin et al. reported similar efficacy of glycemic regulation in the BBR-treated type 2 diabetics. They reported that BBR decreased HbA1c by 2% more than the metformin alone. These findings are in agreement to our present study. Yin et al. treated type 2 diabetics with 500 mg BBR three times daily that is similar to the present study. A recent study  reported that the BBR improves blood glucose, insulin resistance, antioxidants, and metformin-associated lactic acidosis in induced diabetic rat model. MGO was first time analyzed by the present study which is a marker of AGEs related to the diabetic microvascular and macrovascular complications. In the present study, the MGO was decreased from baseline 63.9 ± 16.37 and 59.92 ± 20.70 ng/dl to 35.84 ± 12.56 and 26.64 ± 10.73 ng/d after 3 months of metformin and BBR therapy, respectively (P = 0.0001). Metformin and BBR therapy decreased MGO by 43% and 56%, respectively (P = 0.0001). 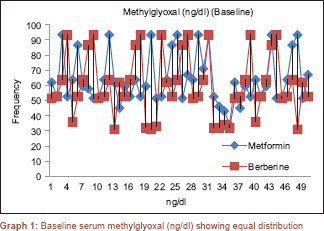 BBR was well tolerated by diabetic patients similar to the metformin; in the present study, these findings are in supported by previous studies., Few of the limitations of present study include small sample size, open-label interventional study design, and ethnical diversity of the study population; hence, the findings may not be generalized. Findings of the present study should be cautiously interpreted for other settings such as the uncontrolled diabetics, different geographical areas, and ethnical populations. The BBR improves insulin resistance (HOMA-IR), and MGO is a new finding which should be further tested in large sample prospective studies. BBR is more effective in decreasing the serum MGO levels and insulin resistance through improved glycemic control in newly diagnosed type 2 diabetic patients. BBR decreased MGO and insulin resistance by 56% and 73% compared to 43% and 40% by metformin therapy, respectively. BBR was found superior to metformin in decreasing the MGO and insulin resistance. We are thankful to the staff of the clinical laboratory of their help for biochemical testing of this project. Milajerdi A, Jazayeri S, Hashemzadeh N, Shirzadi E, Derakhshan Z, Djazayeri A, et al. The effect of saffron (Crocus sativus L.) hydroalcoholic extract on metabolic control in type 2 diabetes mellitus: A triple-blinded randomized clinical trial. J Res Med Sci 2018;23:16. Kachuei A, Amini M, Sebghatollahi V, Feizi A, Hamedani P, Iraj B, et al. Effect of Helicobacter pylori eradication on insulin resistance among prediabetic patients: A pilot study and single-blind randomized controlled clinical trial. J Res Med Sci 2016;21:8. Ogawa S, Nakayama K, Nakayama M, Mori T, Matsushima M, Okamura M, et al. Methylglyoxal is a predictor in type 2 diabetic patients of intima-media thickening and elevation of blood pressure. Hypertension 2010;56:471-6. Chang T, Wu L. Methylglyoxal, oxidative stress, and hypertension. Can J Physiol Pharmacol 2006;84:1229-38. Liu BF, Miyata S, Hirota Y, Higo S, Miyazaki H, Fukunaga M, et al. Methylglyoxal induces apoptosis through activation of p38 mitogen-activated protein kinase in rat mesangial cells. Kidney Int 2003;63:947-57. Dhar A, Desai K, Kazachmov M, Yu P, Wu L. Methylglyoxal production in vascular smooth muscle cells from different metabolic precursors. Metabolism 2008;57:1211-20. Han Y, Randell E, Vasdev S, Gill V, Curran M, Newhook LA, et al. Plasma advanced glycation endproduct, methylglyoxal-derived hydroimidazolone is elevated in young, complication-free patients with type 1 diabetes. Clin Biochem 2009;42:562-9. Kilhovd BK, Juutilainen A, Lehto S, Rönnemaa T, Torjesen PA, Hanssen KF, et al. Increased serum levels of methylglyoxal-derived hydroimidazolone-AGE are associated with increased cardiovascular disease mortality in nondiabetic women. Atherosclerosis 2009;205:590-4. Beisswenger PJ, Howell SK, O'Dell RM, Wood ME, Touchette AD, Szwergold BS, et al. Alpha-dicarbonyls increase in the postprandial period and reflect the degree of hyperglycemia. Diabetes Care 2001;24:726-32. Memon IA, Almani SA, Shaikh TZ, Ujjan I, Kazi N, Khoharo HK. Berberine mitigates insulin resistance in newly diagnosed type 2 diabetics. Int J Med Sci Clin Inv 2017;4:2566-72. 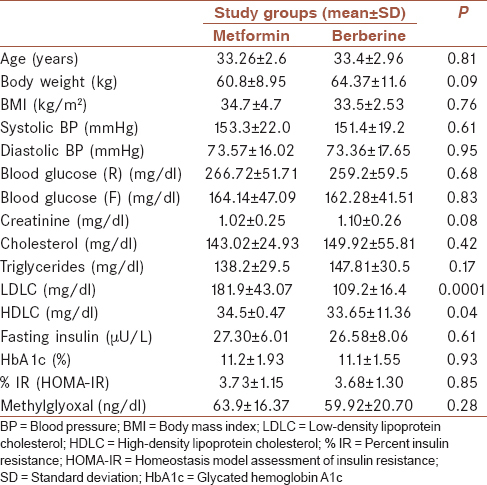 Almani SA, Memon IA, Shaikh TZ, Khoharo HK, Ujjan I. Berberine protects against metformin-associated lactic acidosis in induced diabetes mellitus. Iran J Basic Med Sci 2017;20:511-5. Chen L, Guo W, Zhang S, Lu W, Liao S, Li Y. Berberine prevents high glucose-induced cell viability inhibition and apoptosis in podocytes. Int J Clin Exp Med 2016;9:5942-50. Ni YX. Therapeutic effect of berberine on 60 patients with type II diabetes mellitus and experimental research. Zhong Xi Yi Jie He Za Zhi 1988;8:711-3, 707. Tripathi H, Mehdi MU, Gupta D, Sen S, Kashyap S, Nag TC, et al. Long-term preservation of donor corneas in glycerol for keratoplasty: Exploring new protocols. Br J Ophthalmol 2016;100:284-90. Dhar A, Desai KM, Wu L. Alagebrium attenuates acute methylglyoxal-induced glucose intolerance in sprague-dawley rats. Br J Pharmacol 2010;159:166-75. Lan T, Wu T, Chen C, Chen X, Hao J, Huang J, et al. Berberine attenuates high glucose-induced proliferation and extracellular matrix accumulation in mesangial cells: Involvement of suppression of cell cycle progression and NF-κB/AP-1 pathways. Mol Cell Endocrinol 2014;384:109-16. Lan T, Liu W, Xie X, Huang K, Peng J, Huang J, et al. Berberine suppresses high glucose-induced TGF-β1 and fibronectin synthesis in mesangial cells through inhibition of sphingosine kinase 1/AP-1 pathway. Eur J Pharmacol 2012;697:165-72. Xie P, Zhou H, Gao Y. The clinical efficacy of berberine in treatment of type 2 diabetes mellitus [article in Chinese]. Chin J Clin Healthc 2005;8:402-3. Wei J, Wu J, Jiang J, Wang S, Wang Z. Clinical study on improvement of type 2 diabetes mellitus complicated with fatty liver treatment by berberine. Zhong Xi Yi Jie He Ganbing Za Zhi 2004;14:334-6. Lan J, Zhao Y, Dong F, Yan Z, Zheng W, Fan J, et al. Meta-analysis of the effect and safety of berberine in the treatment of type 2 diabetes mellitus, hyperlipemia and hypertension. J Ethnopharmacol 2015;161:69-81. Dange SV, Shende SS, Rane BT, Tilak AV, Vaidya MU, Limaye MV. An observational study of the antidiabetic activity of berberine in newly diagnosed type 2 diabetes mellitus patients. J Pharm Biomed Sci2016;6:230-3. Yin J, Xing H, Ye J. Efficacy of berberine in patients with type 2 diabetes mellitus. Metabolism 2008;57:712-7. Xia X, Yan J, Shen Y, Tang K, Yin J, Zhang Y, et al. Berberine improves glucose metabolism in diabetic rats by inhibition of hepatic gluconeogenesis. PLoS One 2011;6:e16556. Hsu YY, Tseng YT, Lo YC. Berberine, a natural antidiabetes drug, attenuates glucose neurotoxicity and promotes Nrf2-related neurite outgrowth. Toxicol Appl Pharmacol 2013;272:787-96.